Research Progress on Prevention of Ecological Risk in Land Use XIAO Wen-kui;Weibei Branch of Shaanxi Land Construction Group Co.
Prokaryotic Expression and Immunogenicity Identification of REP Protein of Porcine Circovirus Type 2 XU Ping;FAN Juan;YE Zheng-qin;Yangzhou Youbang Biological Pharmaceuticals Co.
Dwarfing Effects of Different Growth Regulators on Potted Canna indica L. ZHANG Xiao-qin;OU Ke-fang;LIU Chao;Wuhan Institute of Landscape Architecture;Tianyu Eco-Environment Co. 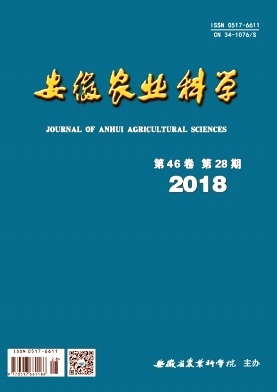 Effects of Plant Growth Regulators on Seed Germination of Wetland Reed ZHOU Chao;Nanjing Zhongke Water Treatment Co.
Study on Landscape Renovation Method of Municipal River Course——Taking Yongan River Extension Dredging Project in Taihu River Basin as an Example WU Xiao-lan;WANG Yun;Shanghai Jiao Tong University;Shanghai Landscape Architecture Design and Research Institute Co.
Study on the Technology of Releasing Fresh Matter from Lotus Root by Enzyme and Substitution of MSG DING Hong-mei;DENG Li;LI Wen-fang;Tianjin Chunfa Biotechnology Group Co. Detection of Escherichia coli O157:H7 from River Water of Guiyang City YUAN Guang-yu;GONG Wei-yao;JIA Ling-ling;Guizhou Kwinbon Science and Technology for Food Safety Co.